In many quarters, Morris Dancing is unfashionable. Long may it remain so! In the last fifteen years or so, like many of the best traditions, it has re-invented itself in many new interpretations, some rooted in the past, many not! It’s high time for some new ones, too! Keep an eye out for “steam-punk” style! I’ve been a (non-participant) fan for many years. As a pastime (I even once heard it called a sport!) it is one of the last resorts of the true English eccentric. For colour, spectacle, beer and genuinely nice people, it is hard to beat. 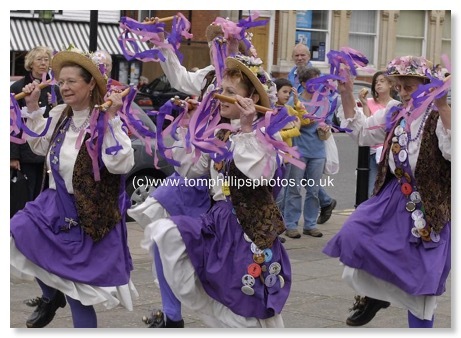 This part of the web site is currently mostly devoted to the Rochester Sweeps Festival. I have other material from elsewhere that I really must get around to adding. Great fun, first weekend in May every year without fail. There are now photos here from the last 11 YEARS of Sweeps Festivals! Sadly, I missed the Monday’s fun in 2012. This last gallery ought to have been larger. However, I had to head for home earlier than intended, courtesy of a migraine. On 10 June 2015 I had a delightful evening photographing the very contrasting Steampunk Morris and the Weald of Kent Morris at Frittenden in Kent. Photos here. 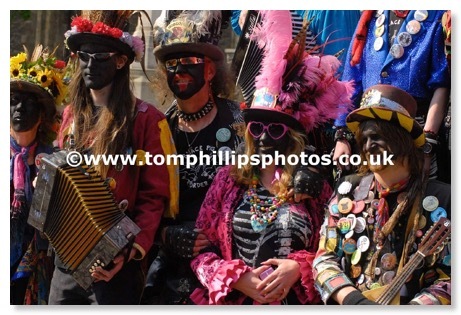 And on 21 September 2016, I was pleased to shoot this set of photos of Steampunk Morris with Bower Street Morris, at the Flower Pot in Maidstone. On 9 September 2017, I got to photograph Cuckoo's Nest, The Seven Champions, and Adderbury Morris, at the Bull at Benenden, in Kent. Photos here.